In this chapter, we present a gravitational search algorithm (GSA) which is based on the low of gravity. We first describe the general information of the science of gravity and the definition of mass in Sect. 22.1, respectively. Then, the fundamentals and performance of GSA are introduced in Sect. 22.2. Finally, Sect. 22.3 summarises in this chapter. David, R.-C., Precup, R.-E., Petriu, E. M., Rădac, M.-B., & Preitl, S. (2013). Gravitational search algorithm-based design of fuzzy control systems with a reduced parametric sensitivity. Information Sciences, 247, 154–173. doi:http://dx.doi.org/10.1016/j.ins.2013.05.035. Doraghinejad, M., Nezamabadi-pour, H., & Mahani, A. (2013). Channel assignment in multi-radio wireless mesh networks using an improved gravitational search algorithm. Journal of Network and Computer Applications. doi:http://dx.doi.org/10.1016/j.jnca.2013.04.007. Ju, F.-Y., & Hong, W.-C. (2013). Application of seasonal SVR with chaotic gravitational search algorithm in electricity forecasting. Applied Mathematical Modelling, 37, p. 23. doi:http://dx.doi.org/10.1016/j.apm.2013.05.016. Khajehzadeh, M., Taha, M. R., El-Shafie, A., & Eslami, M. (2012). A modified gravitational search algorithm for slope stability analysis. 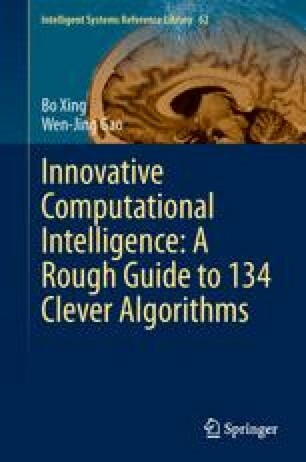 Engineering Applications of Artificial Intelligence, 25, 1589–1597. doi: 10.1016/j.engappai.2012.01.011. Li, C., Zhou, J., Xiao, J., & Xiao, H. (2013). Hydraulic turbine governing system identification using T–S fuzzy model optimized by chaotic gravitational search algorithm. Engineering Applications of Artificial Intelligence, 26, 2073–2082. doi:http://dx.doi.org/10.1016/j.engappai.2013.04.002.